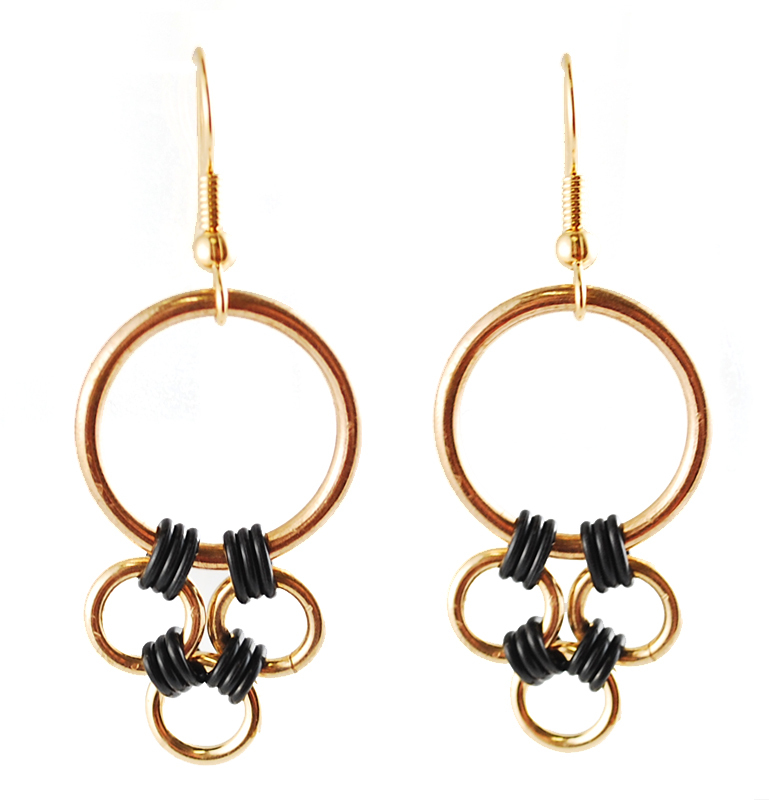 Combine metal and rubber jump rings to create this 3-dimensional domed ring and simple matching earrings. Good pliers and a little bit of hand strength is needed for the higher gauge rings but the project comes together quickly and follows the fall trend of geometric jewelry. If you’re just starting out, you may want to use an easier metal to work with such as aluminum. Like this project? Check out our free jewelry projects here on our blog! 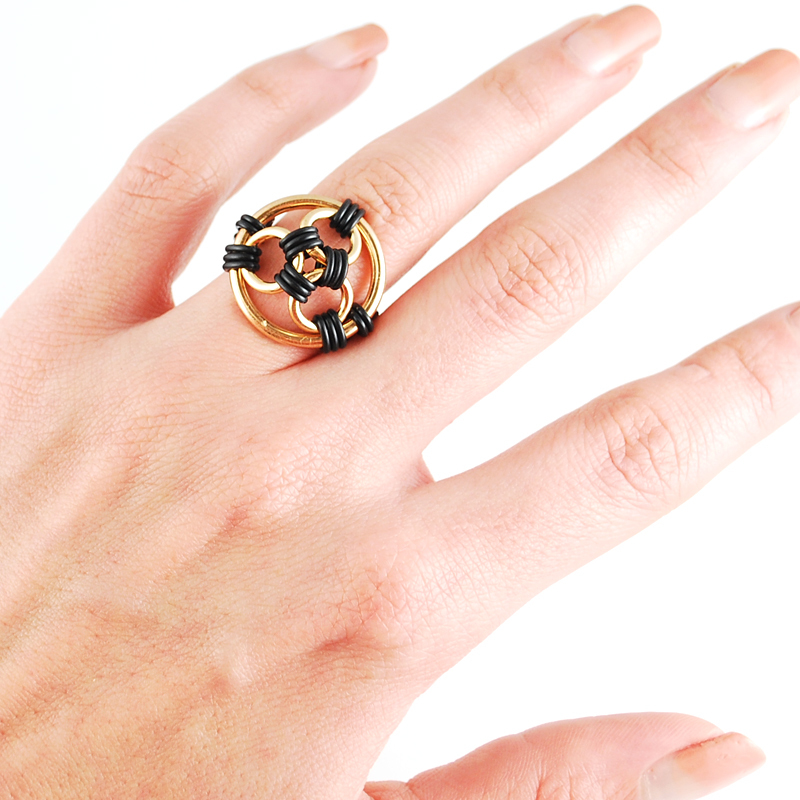 This is a great project for folks who like to wear large rings. The band uses rubber rings so it is easy to fit and slides on and off easily. Note: The number of small and tiny rings you need will depend on how large you need your ring to be. Each set of small rings gives you approx. 5/8″ for the band. 1. Start by scooping 13 tiny rings onto the open large ring. These rings will be used to attach the center domed rings and the band. Close the large ring. 2. Open a medium ring, scoop 6 tiny rings and then weave the medium ring through 3 of the tiny rings on the large ring. Close the medium ring. Tip: You may find it helpful to pinch the rubber rings with your non-dominant hand to make the part your are weaving through a little bigger and easier to slip the ring through. 3. Open another medium ring and scoop 3 more tiny rings onto it. Skip 2 tiny rings for the band, then weave this ring through the next 3 tiny rings on the large ring as well as the 3 tiny rings on the first medium ring. Close this ring. 4. Open one final medium ring but do not scoop more tiny rings. Weave through the next 3 tiny rings that as well as the 3 on each of the other medium rings. Close this ring. 5. The band is simply a 2-in-2 strip. 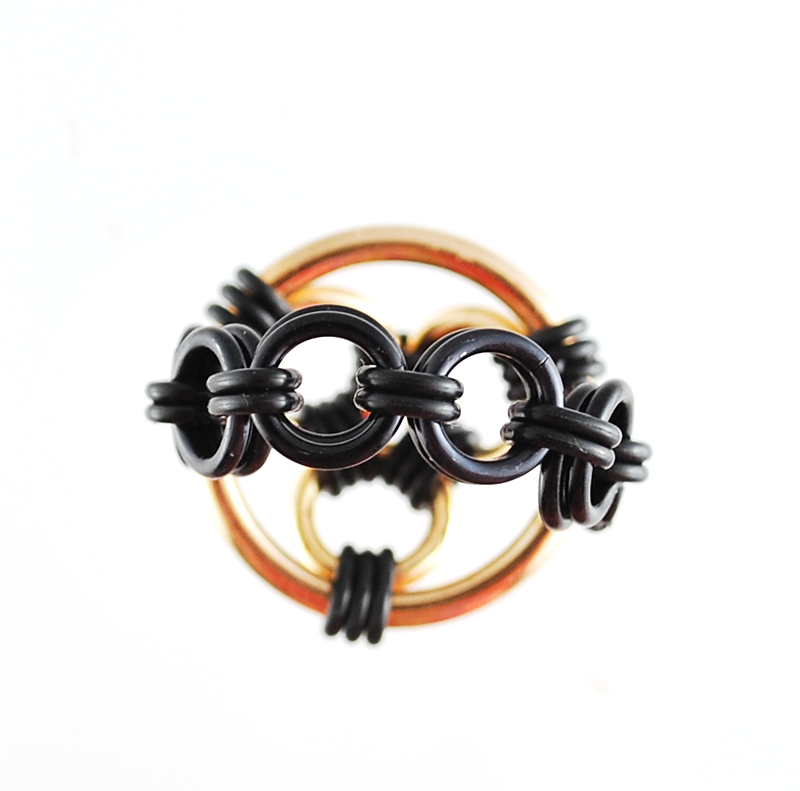 Start by opening a small ring, scooping 2 tiny rings onto it, and weaving it through two of the hanging tiny rings on the large ring. Close this ring and double it. Repeat this until your strip it long enough to wrap around your finger. Don’t forget, the final set of small rings will connect to the other two hanging rings you have left on the large ring. That’s it – you’re done! Because you used rubber rings, the dome will be flexible so you can shape it to lay how you like. You can use the same size rings to create complimentary earrings. Use the same technique of scooping tiny rings onto the large ring, weaving through these and adding tiny rings to the medium rings to build this shape. 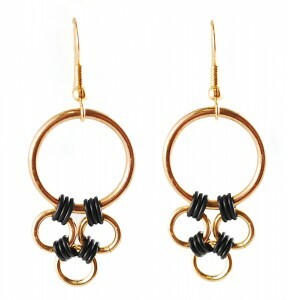 2 Comments on "Free & Easy Jewelry Project: Black and Gold ring + matching earrings"
I the the wonderful designs and patterns that you guys offer. Keep up the great work!